Bread Loaf Mountain Monastery offers a modern version of traditional Zen Buddhist practice. The structure of the daily schedule encourages a wholehearted engagement with every activity of life. Residents follow a daily schedule that includes three hours of zazen and five to six hours of work practice. 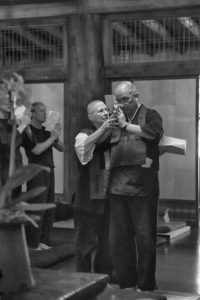 When Sensei Joshin is in residence at BLMM each month, there will be daily liturgy, temple training, and periods of deeper practice and study. The deep stillness of daily practice provides the core pillar of residency. Stewarding our land and buildings, service to the wider community, providing our livelihood, and group Dharma study broaden our expression of wisdom and compassion. Practicing in community opens the heart and supports the aspiration for awakening to the oneness of life. Individual study with the guiding teacher gives personalized guidance and inspiration to one’s practice. Those in residential training live and work at Bread Loaf Mountain Monastery for a mutually agreeable period of time; we recommend that people come for no less than one month, and we encourage long-term practitioners. The suggested fee for residential training is $250 per month; we ask that all who participate in residential training offer some amount of financial support according to their means to help cover the costs of a shared room, community meals, and study with the teacher. Scholarships or full work exchanges are sometimes available. Residential Training Guidelines and Agreements can be requested from Sensei Joshin.